On a slick, snowy day, I flip the electronic shift on the fly, or ESOF, to 4WD high and my heater switches from heat to defrost. Now my heater will not work at all, just the defrost, and on top of that my 4WD is not engaging. 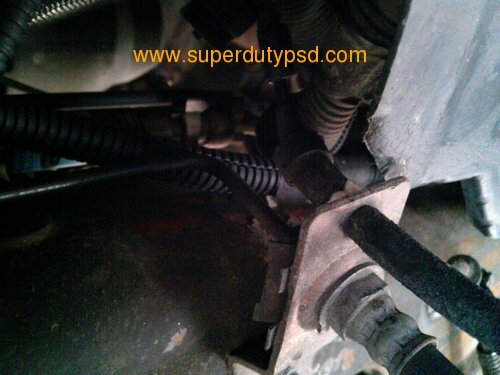 These are classic signs of a vacuum leak on 1999-2004 Ford Super Duty Trucks. On these trucks the hubs are engaged using vacuum. A lot of folks complain about having a lot of problems with these vacuum operated hubs. This has not been my experience; I like them. Many people opt to replace the hubs with Warn manual hubs. Back to my leak. I fear the worst, that I may have a bad hub seal. I look under the fender well on the drivers side right behind the front tire and see the ESOF (electronic shift on the fly) vacuum line just dangling in the air (see fist picture below). What a relief. This will just be a minor repair and I will have my 4WD back easy enough. 3/16" Plastic Vacuum Line Connector. 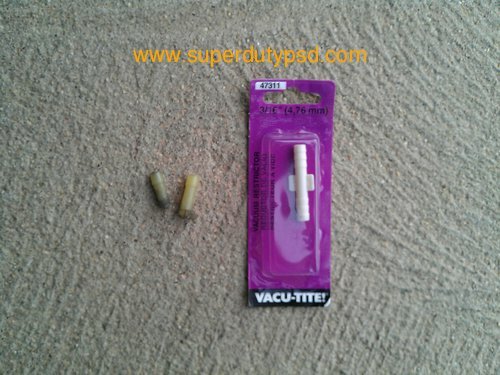 I used a Vacu-Tite 47311, which has a restrictor. The OEM connector does not have a restrictor so I pulled it out and discarded it. 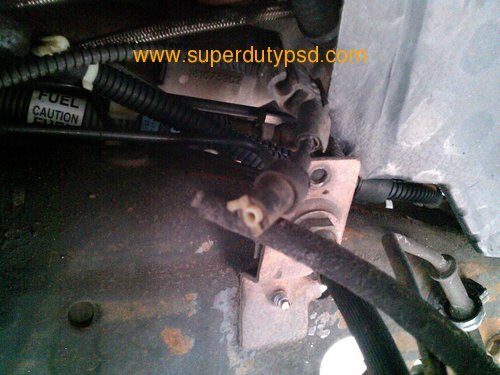 The picture below shows what I saw when I first began looking for my vacuum leak. 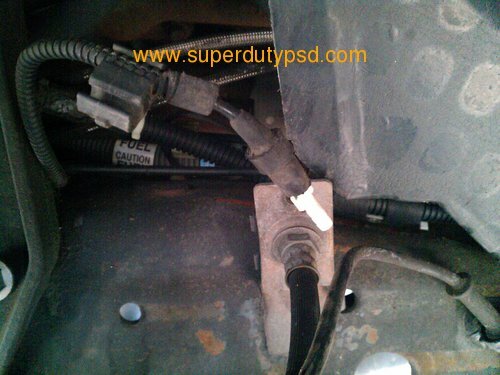 The location is in the fender well behind the driver's side front tire. The two vacuum tubes below in the foreground should be connected at the bracket behind them. Note the white plastic vacuum line connector pieces in each tube. Pull those broken pieces out using needle nose pliers. 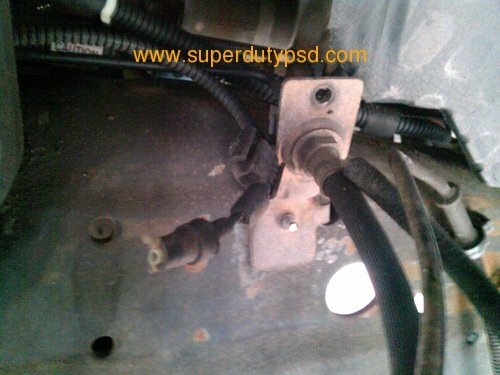 This picture shows the removed broken vacuum line fitting and new fitting I purchased for the repair. The new fitting is a 3/16" vacuum line connector fitting. Press the new fitting into the the vacuum line. 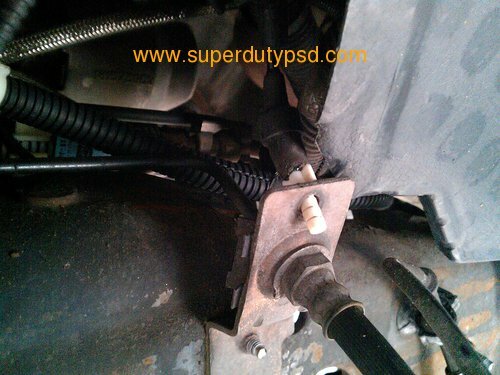 Place the tube/fitting through the bracket. Press the hose from the hub on the other end of the vacuum line connector. It's not too often that repairs are this easy. Had the leak been a hub seal, it would have been much more expensive and taken a lot more time. Sometimes you get lucky.